Wow, looking at all these great books makes me speechless. BEA is pretty sweet when it comes to getting books, but the downside is madness as crowds surge towards the free books. I try to be nice, look around, say “excuse me”, but there are some people who cut in front of you and generally act like you aren’t a person that exists. It can get bad so I think 2 days is long enough for me. That said, I have also met a lot of cool bloggers that I like to hang out with and see yearly, and that’s fun, especially when we get time alone and outside of BEA. Glad you got to go to more of the scifi/fantasy signings this year! And it was good to see you again! I’m also starting to get really disappointed about not finding a copy of Shatter Me. Phantom of the Opera is one of my favorite books and that was partially because of Erik so I am going to have to keep an eye out for it. Heh, yeah I kept my eye out after Kate talked about Shatter Me but they must have all gone on Tuesday! She really had me interested! Aw, thanks! You’re one of my favorite people to hang out with as well and I’m glad to hear I was able to be helpful! Hm, looks like Shatter Me isn’t out until November. Now I really wish I’d found a copy because Kate did make it sound really intriguing! You were SO helpful. I was telling my husband how awesome you were after getting your emails. Without you, I wouldn’t have realized that Mira Grant/Seanan McGuire was making an appearance. Made my week I tell you! What’s crazy is the amount of reviews I’m already seeing for SHATTER ME. Sigh. I didn’t know you where there! I would have liked to say hi! You got a LOT of books I didn’t even see there! 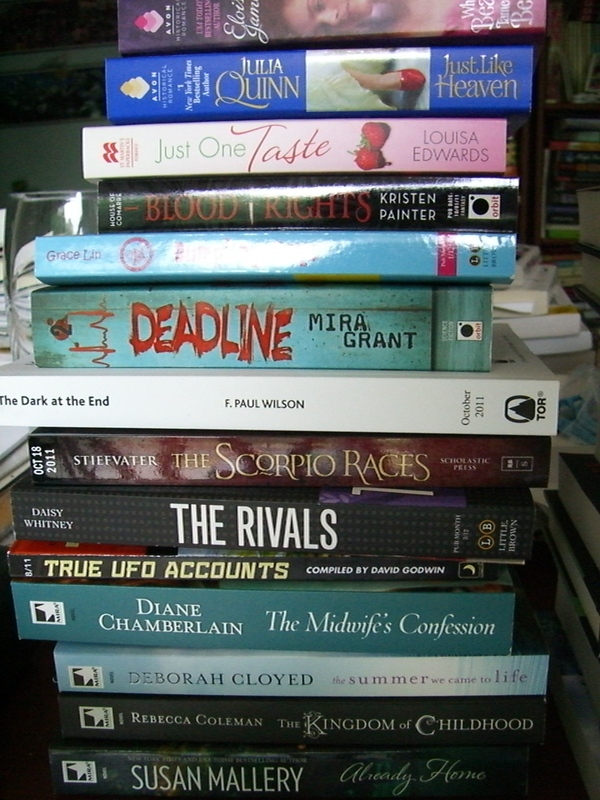 Unfortunately I couldn’t go online to check for signings since my phone was roaming, but I did get a good haul of books (about 45!). I’m going to make a post soon about what I got! *gasp*! I didn’t know you were there either! Are you coming back next year? If so, I’ll give you my number. Yes, so tiring, and then I had to go back into the city to meet friends and walk around AGAIN on Saturday. Actually, I’m just envious of all your signed copies. I’m loving all the BEA posts, though I’m getting the impression that it was on the exhausting side. I wasn’t sure if I’d get the Eloisa James (new for me author), until I heard that it was a Beauty and the Beast retelling. I’m so glad people like it. I’m excited to read it. It was pretty exhausting. I just wanted to leave early most days, so even though I was invited to a couple of parties, I didn’t show. I was just too tired. Ah, I don’t mean to make it out to be something so bad you don’t want to go! It’s just one of those things where if there are crowds and free stuff there are will always be the people who have a Me First mentality. There are of course also plenty of people NOT like this. 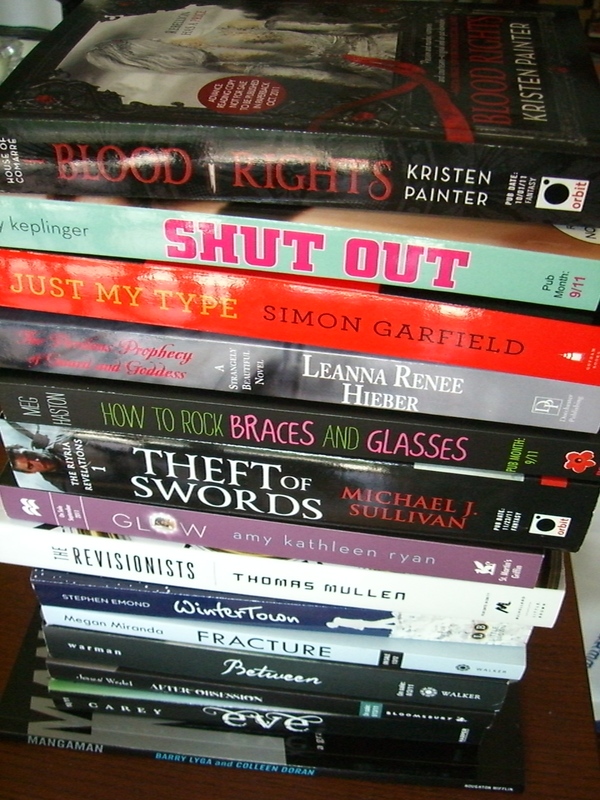 Looks like you had fun at BEA! I heard a lot of “horror” stories and dramas from other bloggers but at least you had fun. I want to go someday, heard there were awesome panels and tons of cool people to meet. I think a few of the publishers did tweet their signings so it was easier for people to follow them. The Name of the Star I think ran out of copies even before the signing started! Did you get 2 ARCs of Shut Out? I want to read that book so much since I loved Kody’s The DUFF. And so jealous you got Wintertown, Between, Eve and Glow! Chachic just said something similar. What’s the horror stories percolating to you guys? I heard a few bad ones myself. I personally had people jump in front of me in line once (at the book blogger convention actually, not BEA), and then a lack of “Excuse me”s which was grating, but this is under general rudeness but not horror. Look at those stacks of cool books!!! Awesome haul! Oooo! Ahhhh! Scorpio Races! I hope her new series is good. I keep seeing Fuzzy Nation everywhere. Hope you like it! I know, every time I go to BEA I feel very very lucky to be living near NYC and am able to go and get books and meet authors. It’s some kind of amazing dream. I have high hopes for both those books. John Scalzi spoke at a panel I went to and I thought he was really funny. That was him? Nice! I have another copy of WINTER TOWN and plan to do a giveaway. It is! It can be extreme. Awesome yet exhausting and draining too. But it only comes once a year. Yeah, I think as time goes on the less attention I pay to buzz because I have plenty to read already. It makes me woefully clueless about what people are talking about sometimes. Like Nomes, I’m excited to see some reviews of BEA books so I can be less overwhelmed and weed out some of the books that fail to live up to the hype. I am jealous of anyone who has a signed copy of a Deanna Raybourn, or has met her. From the vibes I get from her blog and Twitter she seems so classy. Enjoy your books – I’m excited to see some of the giveaways for the duplicates you have. Any books you are particularly curious to see me review? I am trying to decide what to read first. Oh Deanna Raybourn – yes, she comes off as classy and gorgeous in person. I am a bit in awe of her. Oh, that’s a hard question. I’m really curious about Daughter of Smoke and Bone, because I loved Taylor’s Lips Touch. Also, I’ve enjoyed everything Maggie Stiefvater has written so far so I’m really interested in reading a review of Scorpio Races. So she is just as gorgeous in person, eh? A signed upcoming Lady Julia book, so jealous! I was glad to take in some free BEA/NY book week public programming while I visited there last week. It is my precious! I think that one, the Kody Keplinger one and the Mira Grant one were the three books I HAD to have at BEA. Pretty giddy about meeting all three of those authors even though I am sort of a dork and basically my exchange with them was “Can you make this out to Janice?”.. the mind kind of goes blank at these things. Looking forward to your thoughts on FEED and DEADLINE. Now that you’ve got me firmly seated on the Seanan McGuire bandwagon, I’m most curious about her Mira Grant books. I’m not really sure why I don’t have two copies of this book because it was out both days and I’m sure someone would like an extra copy. I should double check that. But this makes me think there will be other bloggers who took an extra for a giveaway (check Fantasy Cafe, I think she’s been reading it and prob will review and I THINK do a giveaway soon). Ah, I’m an introvert too. I think I’m ok like one on one or one on two, but in a group where I don’t know anyone, I’m like: Eeeee, scary. I finished Daughter of Smoke and Bone on Monday and it was incredible. But then, I am a Laini Taylor fangirl too! It was a lot like the stories in Lips Touch: Three Times but as a full length novel (with at least one sequel to follow). I’m not doing a giveaway with the copy I picked up before the signing, though – I am sending it to another blogger who was looking forward to it too. Hopefully I’ll be reviewing it sometime soon, but I do have a couple of other reviews I need to catch up on first. I was at BEA too (and on the Maureen Johnson line–so maybe you saw me without even realizing it!). I was able to go all three days and for some reason I wasn’t tired at all (I only went for one day last year and it killed me…. probably because I had no idea what I was doing.) I think Tuesday was the most intense day. If I remember correctly, SHATTER ME was being signed on Tuesday and I know that there were a ton of YA books being given out. Did you hear about some lady biting someone for a book? I think it was over Richelle Mead’s BLOODLINES. *shakes head* Some people are just insane. Maybe! If you recall someone going to the line and asking: “what is this long line for?” it may have been me! YES, I heard that about the biting!! Crazy! Along with people getting knocked off their wheelchairs. I never saw this so I don’t know if this is wild rumors or if it really happened. Did you see this? O.o I hadn’t heard of anyone being pushed off by wheelchairs until now! I HOPE that’s a rumor because it’s worse than the biting. I wasn’t present for any of the drama (or pulled into it, thank goodness) but all of my friends/new acquaintances wouldn’t stop talking about it. Did you hear about the girl that tried to steal this blogger’s bag of books? Yeah, what I heard about the wheelchair (first I heard it was one, then I heard it was 2), was someone was trying to get to a book and inadvertently knocked someone off their wheelchair. I didn’t hear many details though. It did seem like a mistake at least (and the biting did not). I did NOT hear about the girl who tried to steal another blogger’s bag of books! :O What! 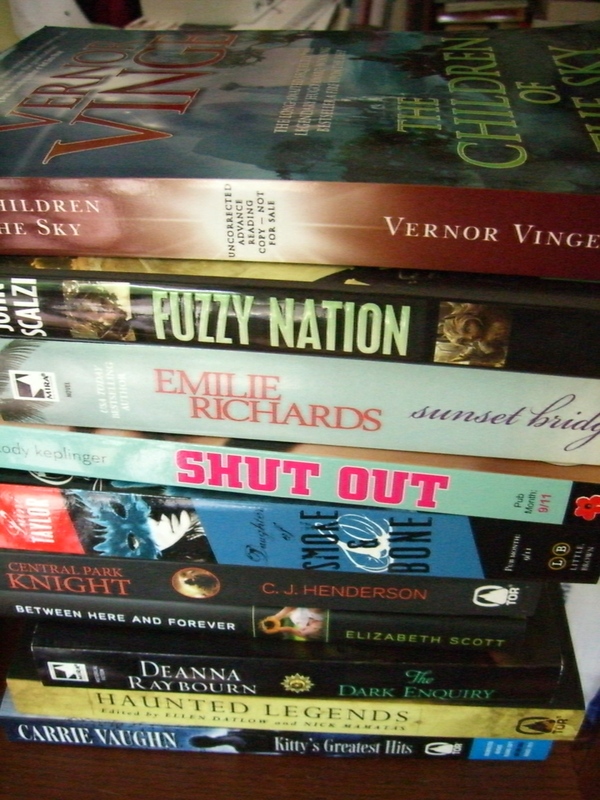 (I remember last year, or year before, a blogger’s books were stolen from the box area, but she left her books on top of the box, not inside). I do remember the blogger that got some of her books stolen. It might’ve been Alea from Pop Culture? I’m not %100 certain. Yup, it was Alea. She’s the one who told me about it so I’m sure it did happen. Man. Well good news is that she did get her bag back, but I can imagine being pretty mad. I’d believe that story if say the other girl’s bag was in place of the swiped one. This reminds me of the time when I was moving out of my dorm and my roommate’s dad thought my backpack was his daughter’s and packed it in their car. AND THEY LOOKED NOTHING ALIKE! But dad’s.. do they know what their daughter’s backpack looks like? No. I was going crazy because my passport and wallet and all my important stuff was in that backpack. Ah man – did I miss getting to chat with you this year? Bummer! I know. Next year! 🙂 So many people to catch up with but too little time.